There is nothing easier than adding images to your map. Images can add a blend of creativity and functionality, and give your map a distinct style. ConceptDraw MINDMAP has a clip art gallery so you can easily incorporate pictures into your maps making them even more memorable and intuitive. You can add images to any element of a map. The method for adding an image is the same for all topics. The following steps show how to add images to your map from the hundreds of images in our clip art library. Be Visually Inspired! 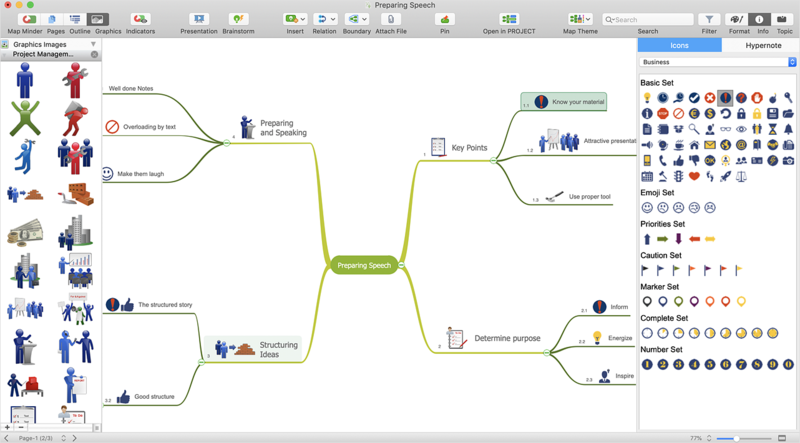 ConceptDraw MINDMAP has more than 900 clip art images, sorted by professional activities. Press F4 to summon the Graphics Images panel. ConceptDraw MINDMAP has more than 200 Quick Symbols. Press F9 (Windows), or press the info button (macOS) to open Symbols panel. Double-click a visual object to insert it into a topic. Result. The visual element will be repositioned automatically if the topic it’s attached to is moved. More than 900 clip art images and 200 Quick Symbols are available. Possibility to fully customize the style of Mind Map.